I began writing this blog on kin 69 last year, however, for one reason or another, I never came to publish it. Today kin 52, I have decided to re-edit and release this work. It was impulsed by a debate on the Planet Art Network Facebook Group regarding the validity of Jose Arguelles claim that July 26th is the beginning of the 13 Moon Year because it is the day of the Helical Rising of Sirius. In this debate, it is claimed that July 26th does not sync with the Helical rising of Sirius and as such, the basis of what Arguelles claims is false. I will attempt to present a series of paradigms that both acknowledge this error in fact, but also give reasons as to why this was done, and why its not entirely relevant anymore. The above image is taken from lawoftime.org. It describes the reasoning behind the Sirius Cycle of 52 years. This is work of Jose Arguelles and is enshrined within the Dreamspell and Synchronotron. In order to come to a reasonable conclusion what I present here is a continuation of the Deciphering the Riddle of the Votan and will include various links to information I have already publicly released during the timeline of this blog. If you are new coming to this, I would suggest you familiarise yourself with the multiple layers that form the philosophy of the 19:19 Crystal Matrix, The Prophecy of the Pyramid, and the understanding that everything we are experiencing, is in fact, an invocation of Self through a dimensional construct contained within the nucleus of a double terminated quartz crystal. Just as the image above from the lawoftime.org demonstrates and describes, the Sirius Cycle of 52 years begins with kin 34, and ends with kin 189 (White Galactic Wizard and Red Resonant Moon respectively). As I presented in Deciphering the Riddle of The Votan, Resonant Moon / Galactic Wizard are distinguished initiation points of the Dreamspell (Galactic Wizard as initiated by Valum Votan on July 26th, 1987 / Resonant Moon as initiated by Pacal Votan on his birth and encoded into the 69 steps of the Temple of Inscriptions). These kin are sequential in the 52 year Solar Galactic Cycle, commonly known in the community as the Sirius Cycle. The current New Sirius Cycle began on kin 34, Galactic Wizard, year of the Galactic Wizard, and will conclude kin 33, Resonant Skywalker on the year Resonant Moon, kin 189. They represent the Alpha-Omega points / kins of the 52 year Sirius Cycle. As presented in the Deciphering the Riddle of The Votan, Pacal Votan was born March 23rd 603 as Resonant Moon, kin 189 in the Dreamspell Count. Remarkably, this subsequent initiation of the Dreamspell (as understood from “our” perspective of time and experience in this) was actually the preceding kin in the “Sirius Cycle”. Therefore, through this information we can really see a provable bridge between the original initiation of the Dreamspell by Valum Votan on July 26th, 1987, Galactic Wizard kin 34; and the holographic initiation of the Dreamspell by Pacal Votan on March 23rd, 603, Resonant Moon, kin 189 which was embed in code into the 69 steps of the Temple of Insciptions being that the sequence of steps 9:19:19:13:9 point to the Long Count kin equivalent of Red Resonant Moon. These 2 4D initiation points are paired in sequence within the “Sirius Cycle” as the beginning (Alpha) and end (Omega). The two 5D crystal archetypes of the 19:19 Matrix synchronised their individual initiations of the Dreamspell in the 4D Time Matrix as the alpha and omega points of the 52 year Sirius Cycle. Curiosity lead me to research more about the 52 year Sirius B orbit/rotation of its much larger and brighter binary twin, Sirius A. Prior to this investigation I knew very little about this, apart from it being presented as a 52 year cycle, fractal backbone of the Dreamspell. After a brief investigation there is little evidence to support the much fabled 52 year Sirius Cycle. There are many scientific papers which have studied the periodicity of the orbit of Sirius B and Sirius A. The first of these was published in 1891. With limited technology at his disposal, he calculated a mean orbit of 53 earth years. 4 years later, with an small advance in technology he revised it to 51.97 earth years. This was the first attempt recorded, however its old information acquired with old technology. Recent studies from the 1970’s onward put the figure at 49.94 years. Approximately 50 years. Certainly far enough away from the 52 years quoted throughout the various publication that declare it as the fundamental base of the Dreamspell. You should do your own investigation on this, there are various sources and papers online, and I do not claim to deliver the precise figure. However it is certain that it is NOT 52 years. Therefore, for me, the Sirius illusion presented by Arguelles is shattered. The Great Sirius Code of 52 years does not actually exist. Certainly the 52 year fractal exists, but its relativity to Sirius is certainly brought into doubt. In all fairness Arguelles probably based his understanding on the information available at the time. He probably read about the 52 year cycle in a book that was published before the currently accepted value of 50 years was accepted by the scientific community. It then appears that in realising that he was misguided in this assumption, he elegantly passed the book of responsibility, and attributed this information as being sourced from The Knowledge Book. In this series of points, 19 of them. Jose passes the responsibility of answering this extremely relevant and important fundament to The Knowledge Book. The small Sirius is also called the second Sirius. Its rotation period around the big Sirius if 52 years. Note: A question was asked. In the world calculations the rotation period of small Sirius was calculated as 50 years. What is the reality, 52 or 50? Answer: In world calculations the period deviations of the zodiac units in the 50 years rotation has not been calculated. So, as you can verify for yourself, not even the Knowledge Book serves to answer the all important question, and leaves a distinct layer of ambiguity that should not exist in such a serious matter. Certainly not when a whole community of believers are induced into a spell. The Synchronotron, the 21×21 Matrix also clearly states that the fundamental base of its circuitry is the 52 year Sirius Cycle. The system of Synchronotron is a tool for learning the mathematical language of telepathy, which is coded into the Law of Time. It is a teaching from Sirius that contains the language of post-conceptual mind. Sirius is a binary star – Sirius A and Sirius B. It takes Sirius B approximately 52 years to go in an orbit around Sirius A. This is the basis of the 52- year solar galactic cycle (and why the galactic compass is also called the Sirian Wheel). One thing to make very clear here is that there is no doubt in the authenticity and precision of the Dreamspell, and its harmonic relationship to the Sacred Tzolkin. The 52 fractal harmonic is perfect. It’s Earth 4D timing core. But why have we been taught that this fractal 52 harmonic comes from this 52 year Sirius B orbit, which does not exist. It makes me question why. Why do we look out of our Earthly domain for information ? Why do we presume this information is being beamed to us from another star system ? Why is the backbone of the 13 Moon / Dreamspell and Synchronotron attributed to the non existent 52 year Sirius Cycle instead of stating that this frequency and harmonic is born on Earth. Should we not use this realisation as more reason to trust in our wondrous and perfect planetary home on its curious journey through time, space and dimensions. There are 52 weeks + 1 day in an Earth year (not including the 0.25 synchroniser though the leap day imposed every 4 years). This is the basis of the 13 Moon Calendar. Should we not engage its beauty and work together with the Gaian crystal consciousness. Instead of waiting for news from the stars that may or may not arrive through what Arguelles describes as Galactic Beams. Could it not simply be, that we, as humans are the pinnacle of the evolutionary sequence, and the sequence is bringing forth tools and practices that enable us to construct a Universal Constant of infinite knowledge and love, the highest of the highest self. That we are in fact shifting our own consciousness towards the ultimate goal of dimensional totality of Self. The prophets of our age have surfed the waves of evolution and have interpreted the codes and information they have received and literally created fictional prophecies around them. The Bible is a great example of this. Whilst the numerical codes are clear, the tangible scripts in which they are presented seem old and out of date. Arguelles in his own words, made the prophecy up. Many other authors of recents years have made bold claims of interstellar hierarchies, dimensional federations, real fantasy paradigms etc etc. Could it not be that these myths are actually creative fiction born from the curious, intellectual and beyond anything else, creative imagination of the authors. I can certainly confirm this has been my personal process of channelling the information and codes of the 19:19 Matrix. Whilst I know the information comes from the Universal Constant, in order to access and interact with this Constant, its taken a rather creative imagination to break the barriers and create the tunnel so the information could flow freely. I’m probably as guilty as Jose for the over zealous use of icing on top a perfectly baked cake. Therefore, what I am implying here, is that not everything we are told, or channel is entirely correct. Not that it has ever been intended to misguide or deceive us. It has been constructed by human minds forging connection towards the Universal Constant. Human imagination has helped to build the bridge. Too much icing can ruin a cake. You may have never heard of this proverb, because I invented it just now. I invented it to serve as proof that whilst the proverb does in fact ring true, its a complete and utter invention of mine to suit to the purpose of this post. Arguelles himself, appears to have fallen into this proverbial trap, of putting a little too much icing on the cake. Probably to appeal to new age communities who were, at that particular time being drip fed interstellar mysteries and fictional novels based on some creative and visionary states. However, we must respect that the role of the shaman/magician is to enter the higher mind of self, the higher realms of imagination and bring back, into the 3D a series of scenes that create the vision with the intention of helping the initiates to understand and enter the spell. They are the prophetic nodes that the prophet uses as building blocks to forge the higher connection to receive the download. 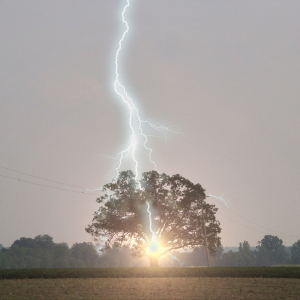 Just like the Earth does as the bolt of lightening comes down from the sky. Unlike the bolt of lightening above, these higher dimensional visions are mostly impossible to prove scientifically, and therefore offer the initiate the option of removing the icing to enjoy what is, when you peel away the sugary layer, a well baked and indeed tasty cake. I have come to the conclusion that Arguelles’ description of Sirius as the impulse of the Dreamspell and Synchrontron is in my opinion, not entirely correct. In my world view, in my understanding of the hologram and works of the Votan as demonstrated in the 19:19 Crystal Matrix system of 2 x 5D archetypes. You of course have the free will to decide. You can have your cake with the extra layer or not. I feel the Sirius Agenda is actually the punchline to the cosmic joke he often talked about. And that we shouldn’t take it all so siriusly. For me, its but another riddle to be solved in order to keep peeling away at the layers of truth until we arrive at the nucleus. One thing is certain, the Sirius story enchanted everyone into the matrix and spell, it was a good script to form the basis of the information. Now, however, I feel we must dispel this illusion and move forward, heads held high with a fine balance between myth and science. So with all of this in mind, I propose a subtle shifting of perspective. One that has faith in ourselves as a race, as a species, as a conscious navigator of our own destiny. A shift that helps our our souls return to their true timeless home, which is the transcendence into our higher self. To embody this shift of perspective I propose we change the current Sirius Cycle, which begun on kin 34, Galactic Wizard. In this New Earth Cycle, anyone (NE1) can participate in the responsibility for the navigation of TimeShip Earth. We no longer accept that influences from outside of our domain can penetrate our conscious evolution. We are not waiting for instructions from the stars. We take control of our mothership, as interconnected nodes within the Crystal Matrix and invoke our sacred Earth Magik to fix the bugs in our collective evolutionary process. Arguelles has done us proud, he plucked the codes we follow from his higher self, he delivered them perfectly packaged in order to enchant the initiates into the Dreamspell, the 4D Time Matrix. He fulfilled his role as a 5D archetype, as a Votan pretty much perfectly. For me there is no doubt in the authenticity of Valum Votan (Jose Arguelles) as a prophet of time and as a 5D archetype within the Crystal Matrix. So with that said and done. The New Earth Cycle began on July 26th, 1987, kin 34 Galactic Wizard, year of the Galactic Wizard NE1.0.1.1. Valum Votan initiated the Dreamspell on kin 34, July 26th, 1987. 34 days after the solstice on kin 34. Pacal Votan initiated his part of the Dreamspell on kin 189, March 23rd, 603AD. Day 241 of the 19:19 Matrix. 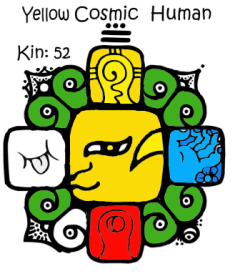 Kin 34 is the year bearer of the first year of the New Earth Cycle, it is the Alpha. Kin 189 is the year bearer of the final year of the New Earth Cycle, it is the Omega. The Alpha Omega of the 52 year fractal, just like the Votan Twins demonstrated in the construction of the 19 Matrix Pyramid of 1330 years, and how it miraculously synchronised the Death of Pacal, and the arrival to Galactic Synchronisation. This synchronicity was only discovered because Valum Votan incepted the Dreamspell to begin on July 26th, 1987. This is why July 26th is the first day of the new year. Because it synchronises perfectly within the 19:19 Matrix and thus proves the telepathic connection between Pacal and Valum Votan as the 5D crystal archetypes within the Matrix. Remember they connect through day 241 of the matrix, where the two crystal meet and continue the sacred walk to the top of the pyramid. Therefore, it doesn’t matter if the Helical rising of Sirius is on July 26th or not. In fact, the whole story about Sirius is irrelevant. It doesn’t need to exist anymore. It was a nothing more than a node that forged the creative base for uncovering the codes that were necessary to be discovered. As any of you who have followed this blog will understand, Jose Arguelles, Valum Votan as his 5D archetype, acted perfectly within his role of delivering and incepting the 4D time matrix. There is no doubt about it. As we investigate this and deconstruct his work and what he stood for as a prophet in the matrix these new understandings we are finding require a perfect balance between science and myth. I personally believe, we have already arrived to this point. It was, in my humble opinion, New Earth Synchronisation point, day 19:19 of the 1331st Year/Cube of the 19 Matrix Pyramid of Ascension. We’ve already completed the prophecy, it is already written, enacted and done. The Votan twins have completed the journey, up the sacred pyramid and activated the merkaba, and now, its your decision as to whether you follow this code that has been miraculously created as a multidimensional holographic path of initiation . You have choices. You have the same free will associated with the power of 52 that is encoded within the Cosmic Human. Your personal free will allows you to remove the icing from the cake and begin to penetrate the many layers which ultimately lead to the grandiose realisation that we are within a wondrous multidimensional hologram which is synchronised to the crystal core of our Timeship Earth. You can transcend the wisdom. You can seal the process of free will. You can be guided by the power of divine intelligence. So, with all that said. Feel free to Laugh Out Loud.. because the punchline of the cosmic joke that Jose talked about was perfectly encoded in time. Released on the perfect day. You don’t have to take everything so Siriusly… but you can certainly enjoy the cake. tickled pink, ..the icing and the cosmic joke..New Earth Cycle..that sort of brings the responisibly right down to us doesn’t it…;) which is of course exactly where it lays. as a channel, I am given information without necessarily understanding what it is at the time, you just decoded and explained it for me, and has given me now some pieces of this puzzles together in my own discoveries..thankyou. Thanks for popping by dear Shirley.. big love xix.. Thank you, this blog post is very grounding. It is all to easy to get caught up in the airy-fairy (icing) part of the Dreamspell, which I have experienced personally myself. If we are to truly manifest the 13 Moon calendar as the harmonic standard of Time in our present world system, we need to find that balance between myth and science, the balance between the icing and the cake, the balance between Earth and the heavens (star systems). We can respect the message brought through by the prophets, but the time of prophecy has passed. May the New Earth Cycle be recognized by many, and may timeship Terra-Gaia once again move to perfection through ever increasing levels of synchronicity – through syntropy. Again, I appreciate the words in this blog. Such a lovely prayer, Crystal Skywalker Poet, let us repeat that one 19 x 19 times….to connect the magik mythik mathematik ! Diaramaa. Great News! I had been trying to get to grips with the Synchronotron and its 21×21 matrix. Not easy, but in my personal life the 441 now pops up as a relevant number, the little house-dwelling that is offered me in hometown Amsterdam adress… Kometensingel 441 ! Too good to be true for a Solar Sun ? Truth versus facts…. And then, this day, kin 34, solar Moon Year, I am HAPPY TO FIND confirmation on the TRUE CRYSTAL Healing properties of the 19×19 matrix! Following the mystic sacred number 19, key to Al Khoran Karim, mathematics and myths entertwaining to entertain our thoughts and guide our lives to higher dimensional understanding and, following the Omaga kin 189, Galactic Dog the integration of LOVE and LOYALTY. Let us be proud to be able to stay loyal on the path of discovery, loyal to our prophets that wooed us onto the path to find our own 19 facetted Earth Crystal! Great News, Gar, and unlocked in Eternal Endless Time for me, yours truly Solar Sun… In LA KÉCH!